Hello – thank you for hosting GAPS Friendly Friday! I’m sharing my Blueberry Coconut Butter recipe. It’s like a nut butter, but made from coconut (and blueberries) instead! I also host my own linking party on my website on Fridays called Whole Food Fridays. Would love it if you stopped by and shared a recipe sometime! I shared my grain free fig tart — just eat small amounts at a time! Hi! Thank you for hosting! This week I shared my recipe for Kale Chips. Thanks for hosting! This week I’m sharing my experiences after a year on GAPS. It’s hard to believe I’ve been doing GAPS this long! 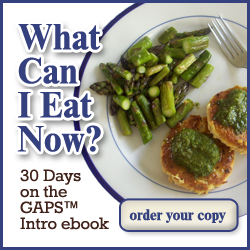 I’m also sharing my giveaway for a copy of the 30 Days on GAPS Intro Handbook. Such a great resource! Freezing Squash It is so easy! Black-Eyed Pea Salad Using garden fresh peas makes this a great summer meal!